> It is a Test tool in Selenium tools suite, to develop and execute Test cases. > It is a Firefox plug in, works only on Firefox browser. > It provides Graphical user interface for Recording user actions using Firefox browser, and we can Insert/Edit/delete statements/steps. > Firebug and Firepath are used to inspect elements or we can use Page Inspector feature to inspect elements. > Selenium IDE should only be used as a proto typing tool. Target – Identifies the Element on the Web page. 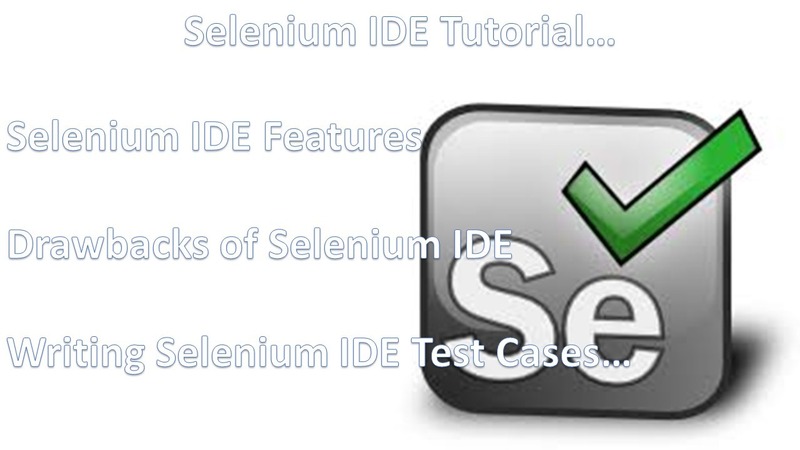 Selenium IDE Commands are known as Selenese commands. > Supports only Firefox Browser, doesn’t support other browsers. > No flow control statements, so we can’t use programming logic for enhancing test cases. > Data driven Testing is not possible. > Launch Firefox browser, download Selenium IDE from the seleniumhq.org website. > Install the Selenium IDE plug in. > After Firefox Reboots then we can use Selenium IDE. > Debug Test Cases using Breakpoints. File menu has options for Test Case and Test Suite. > Export Test case in a language of our choice. Note: All these options available for Test suite also. undo etc… for editing test steps. During Recording it generates steps (Command and Target) for every user action on AUT. It can generate verification points also. Using Selenium IDE commands /Selenese commands and Element locators we can type Test steps. A command tells Selenium what to do. Selenium commands come in three flavors: Actions, Accessors, and Assertions. i) Actions are commands that generally manipulate the state of the application. They do things like “click this link” and “select that option”. If an Action fails, or has an error, the execution of the current test is stopped. ii) Accessors examine the state of the application and store the results in variables, e.g. “storeTitle”. They are also used to automatically generate Assertions. iii) Assertions are like Accessors, but they verify that the state of the application conforms to what is expected. Examples include “make sure the page title is X” and “verify that this checkbox is checked”. An “assert” will fail the test and abort the current test case, whereas a “verify” will fail the test and continue to run the test case. open -opens a page using a URL. click/clickAndWait -performs a click operation, and optionally waits for a new page to load. verifyTitle/assertTitle -verifies an expected page title. verifyTextPresent -verifies expected text is somewhere on the page. verifyElementPresent -verifies an expected UI element, as defined by its HTML tag, is present on the page. verifyText -verifies expected text and its corresponding HTML tag are present on the page. verifyTable -verifies a table’s expected contents. waitForPageToLoad -pauses execution until an expected new page loads. Called automatically when clickAndWait is used. waitForElementPresent -pauses execution until an expected UI element, as defined by its HTML tag, is present on the page. Note: Value is only for a few commands. In Selenium WebDriver Test Cases can be created using Element Locators(id/name/linkText/partialLinkText/className/tagName/cssSelector/xpath) and WebDriver Commands/Methods.